How does one book TV Commercials? Well, you’ve got to start with training and become a good actor! Master Talent Teacher Carolyne Barry has compiled this video to help take you through the process. Who Books Commercials and Why? Most every new actor I talk to is seeking direction, what to do and where to go to become a successful actor. The first few years are crucial for building the actor's craft and career. This is why I wrote HIT THE GROUND RUNNING - to supply the necessary information, tips and insights to create the foundation and to help start a career in acting. GETTING THE JOB includes advice not just from teachers, but also from industry professionals who are casting and representing actors every day. These are casting directors, agents, managers and producers who understand who gets cast and why. Now you can listen to these professionals over and over again before each audition you have. LIGHTS! CAMERA! KIDS! 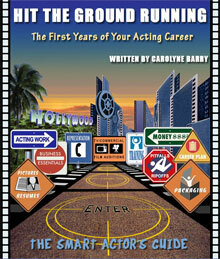 is a complete guide to the highly rewarding world of commercial acting for children.